Hello! I'm finishing up the Summer PixieDusts today with Zoya Liberty and Miranda. I used these for my Galaxy Mani here, but I thought I'd show them on their own too. Liberty is described as a "blue sugary sparkle". And it's funny that they describe it like that because I finally figured out what these remind me of. Those sugars you put on Christmas cookies. And we have one that looks just like Liberty. It also turns your fingers blue when you decorate with it...a lot like how your fingers look when you remove Liberty. I have heard people mention the staining and then I experienced it for myself; HOWEVER, I simply washed my hands after I removed it with Zoya Remove+ and it came off. There may have been a few blue spots by my cuticles; but other than that, it wasn't that bad. Miranda is described as a "rose sparkle". They both applied just as easily as the others. I have two coats here and in certain lights, you can still see a little bit of the nail - so some may prefer three coats. And a bonus picture just cuz I thought it looked kindof cute! If you missed my review of the other PixieDusts from the Summer 2013 Collection, check them out here. Today is my "Friday". I have tomorrow off because my brother is getting married. I'm decorating the cake tonight and we are headed north tomorrow morning. Have a great weekend everyone! 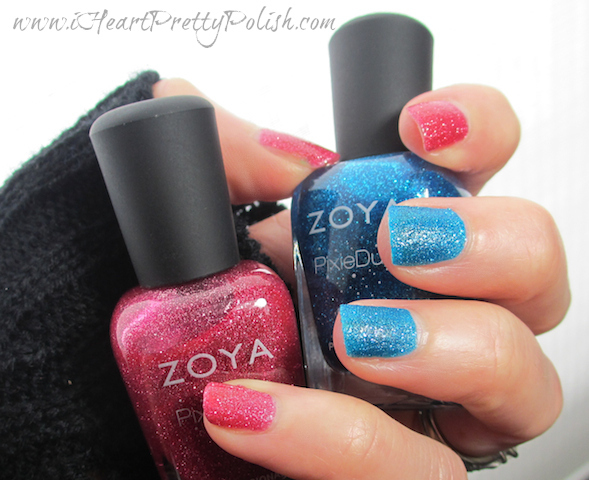 Note: The Zoya PixieDust Collection was provided to me for my honest review. See my Disclosure Policy for more information. Me too...and I know you aren't suppose to. Also have a great time at the wedding. I really don't like the pixie dust polishes, until you put a top coat on them. I guess I'm just not much of a textured polish lover. I do like these colors though, after the top coat. Great colors for summer. How hard is it to get these polishes off? Are they as bad as glitter? I didn't think I would like them either, but I like them more than I thought. They aren't quite as bad as glitter, but they are a little annoying because it tears up the cotton round a bit... but it's worth it. Have a great time at your brother's wedding! And I hope you post a picture of the cake! Yes, Liberty is great! Thanks. Do you have any PixieDusts yet??? Oh I really like them with the topcoat! Liberty looks absolutely amazing...yum! Thank you for showing them with topcoat too! You are welcome! Thanks for stopping by.